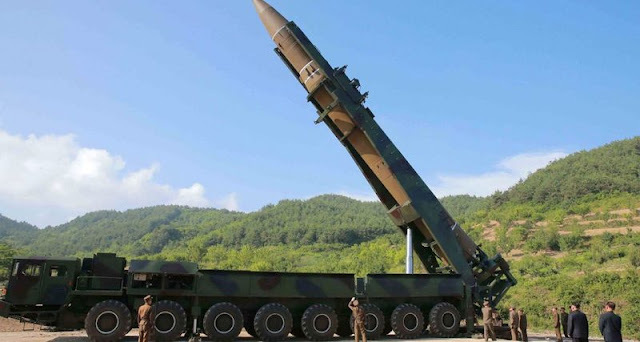 Norh Korea recently test-launched a long-range missile capable of reaching Alaska. When North Korea eventually builds a missile capable of reaching the U.S. mainland, it will double down on its well-known shakedown of feigning indifference to American deterrence while promising to take out Los Angeles, San Francisco or Seattle unless massive aid is delivered to Pyongyang. Kim Jong Un rightly assumes that wealthy Western nations would prefer to pay bribe money than suffer the loss of a city -- and that they have plenty of cash for such concessions. He is right that the medicine of taking out Kim's missiles is considered by Western strategists to be even worse than the disease of living with a lunatic regime that has nukes. No wonder that the Clinton, Bush and Obama administrations had few answers to serial North Korean lying and deceit about its nuclear intentions. Sanctions were eventually dropped or watered down either on reports of the mass starvation of innocent North Korean civilians or on false promises of better North Korean behavior. China publicly promised to help reign in its unhinged client while privately doing nothing. Apparently, Beijing found a rabid North Korean government useful in bothering rivals such as the Japanese and South Koreans while keeping the U.S. off balance in Asia and the Pacific. The dynamic economies and pacifism of Japan, South Korea and Taiwan were taken for granted by China as easy targets for coercion and blackmail. Russia is never any help. Under President Vladimir Putin, Russian foreign policy is reductive: Whatever causes the United States and its allies a major headache is by definition welcomed. There seems to be zero chance of a North Korean coup or a Chinese intervention to remove Kim. The brainwashed North Korean population is cut off from global news and knows nothing other than three generations of Kim family dictators. The military junta that surrounds Kim is likely as aggressive as its leader. These functionaries see his survival as the only guarantee of their own privilege and influence. A preemptory strike might not get all of North Korea's nuclear missiles and could prompt a conventional response that would wreck nearby Seoul -- a scenario about which North Korean openly brags. Pyongyang believes that only the Israelis are wild enough to preempt and bomb neighboring nuclear facilities, as they did in 1981 against Iraq and again in 2007 against Syria. And yet Israel attacked only because neither Iraq nor Syria had created deterrence by possession of a single deliverable nuclear weapon. What are the bad choices for the Western alliance in defanging North Korea before it miscalculates and sends a missile that prompts a war? Sanctions have in the past crippled Pyongyang. But this time around they should not be lifted despite the prospect of ensuing chaos in North Korea. It may be tragic that a captive population suffers for the lunacy of its leader, but such misery is still preferable to an all-out war. Nor should China be exempt from accompanying stiff trade restrictions. Almost every weapon component in the hands of North Korea either came directly from China or was purchased by cash earned through Chinese trade and remittances. Certainly, China would not allow South Korea to send missiles its way along with promises of nuking Beijing while the U.S. kept still about the provocation. Australia, Japan, South Korea, Taiwan and the U.S. need to coordinate a massive missile defense project aimed at ending North Korean assumptions that even one of its missiles has a chance to reach its intended target. Such a Marshall Plan-like investment would also send a message to China that its own nuclear deterrent could be compromised and nullified by the defensive efforts of its immediate neighbors. China has made life difficult for the U.S. and its Asian allies, and it should learn that the allies could make things even more problematic for China. None of our allies in Asia and the Pacific wish to develop nuclear weapons, both for historic and economic reasons. But the United States should inform Russia and China that allied democracies in the region may choose to develop a nuclear deterrent to stop North Korean antics -- a development that would prove disastrous to both Russian and Chinese strategic planning. Asia is already a dangerous place, with both Indian and Pakistani nuclear missiles and a likely nuclear Iran in the not-so-distant future. Do Moscow and Beijing wish to add three or four more nuclear powers near their borders? The current danger is not just limited to North Korea. Iran, a beneficiary of North Korean nuclear assistance, is watching how far Kim can go. It will certainly make the necessary strategic adjustments if he succeeds in shaking down the Western world. We are nearing an existential showdown, as failed efforts at bribery and appeasement have run their course. Only a tough, messy confrontation now can prevent a disastrous war later on.